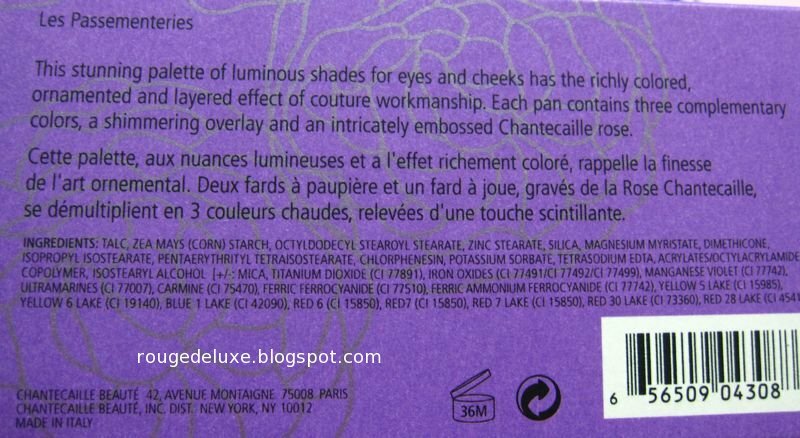 Awhile ago, I ordered some Chantecaille items from Nordstrom.com. 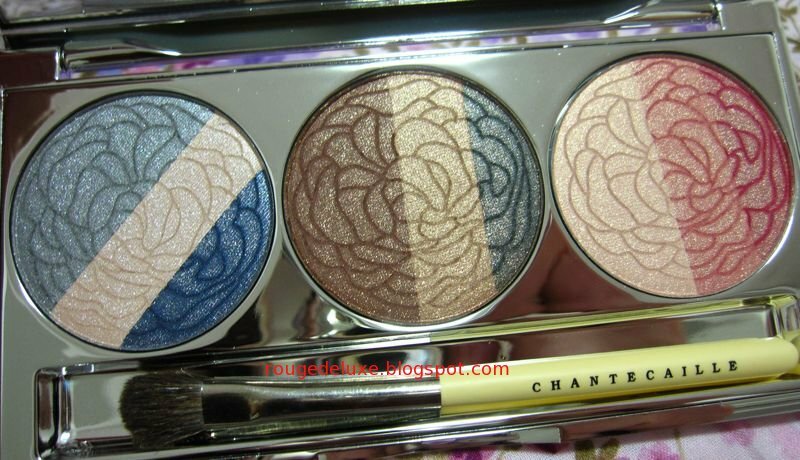 I had been quite pleased with the pigmented and silky shades in the Bengali palette which I picked up in Honolulu earlier this year so I was looking forward to trying out more Chantecaille products. 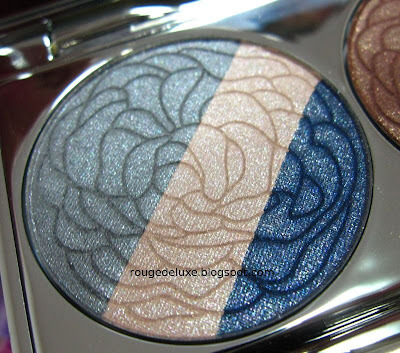 I got the Les Passementeries palette, along with a Lip Chic and Luminous Eye Liner. Les Passementeries looked very attractive online due to the mix of shades but alas, I should have known better and checked the reviews on MakeupAlley first. As it turns out, the shimmer is merely an overspray that disappears quickly when you first use the shades. After the overspray disappears, the shades are actually have a soft matte finish. Below is the product description on the box. 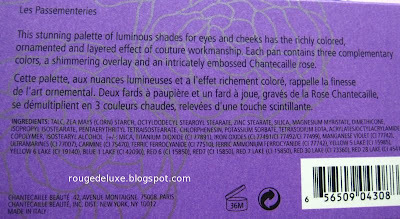 The most misleading part of it is the description of the palette as "richly colored". 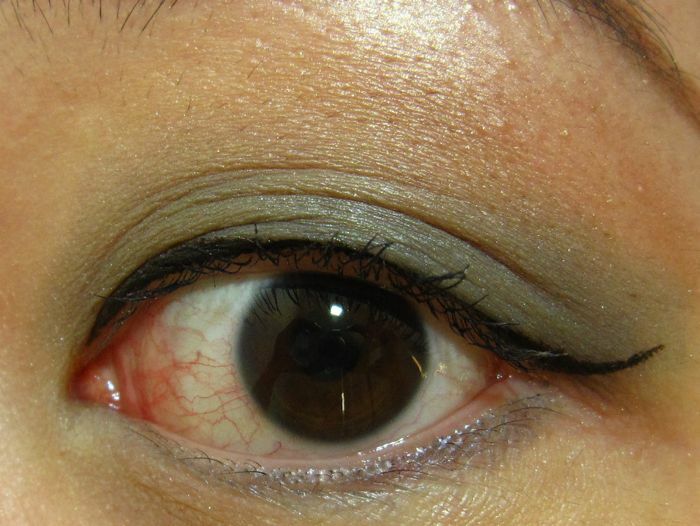 In reality, the shades apply sheer even when used over a base and take a lot of layering to get them to show up well. The part of the palette that I was most looking forward to was naturally the blue trio. 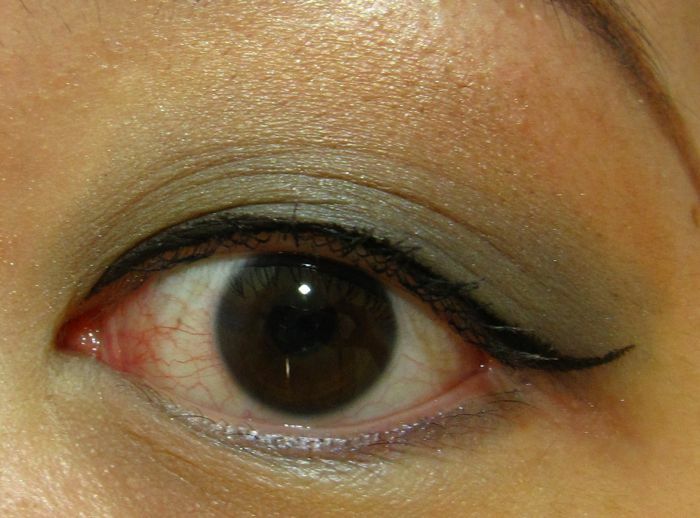 Sadly, the lovely medium blue shade on the right side applies much paler and more greyish than how it looks in the pan. After prepping with Urban Decay Primer Potion, I used the included brush to apply the light beige shade over the browbone area, the light greyish blue shade from the upper lashline to the crease, the medium blue shade along the upper lashline and the outer corners, and the medium brown shade above the outer half of the crease. As you can see, the blue shades turned out to be a matte-ish grey rather than blue. 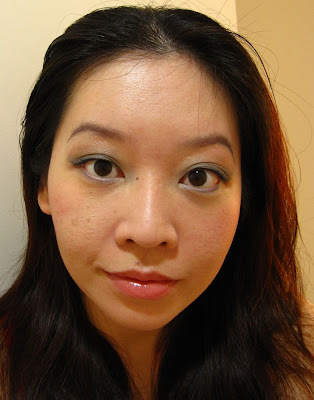 I also tried using a sponge tip applicator to intensify the medium blue shade but it did not help much. The overall look was just too blah and muted for my liking. The blush was better though in terms of colour payoff. 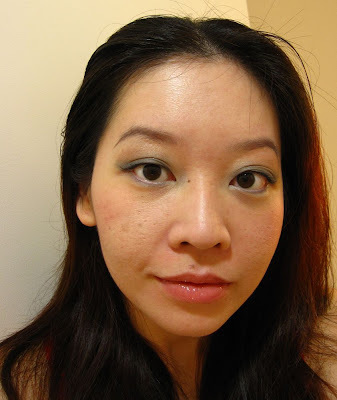 For this look, I also used Dior X4 Control Compact Foundation 012 over RMK Face Protector N SPF31, Shiseido Nourishing Mascara Base topped with Visee Lash Wide Impact (Curl Long) BK002, K-Palette Real Lasting Eyebrow 01, Heroine Make Smooth Liquid Liner, Paul & Joe Lipstick C 067 topped with Esprique Precious Aurora Crystal Gloss SP002 (from the Twinkle Story Collection), Jill Stuart Loose Powder 01 Natural and Dior Skinflash Radiance Booster Pen. Great review! It's a shame that you were disappointed with the product. I don't understand why they bother putting a shimmer overspray in the first place, that's so misleading! 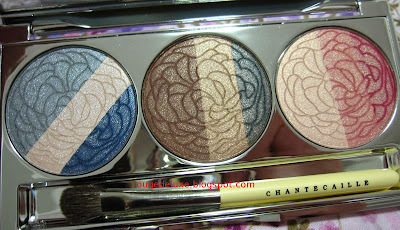 the palette looks so gorgeous.. pity it didn't live up to expectations. Do you happen to know if there are any Chantecaille counters in the region? how much is the shpping to sg? A friend helped to send the items to me from the US. You can check the shipping rates on Nordstrom.com. 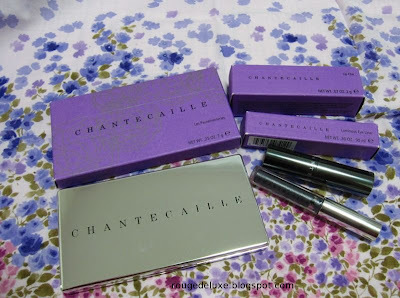 Chantecaille is also available in Taiwan. 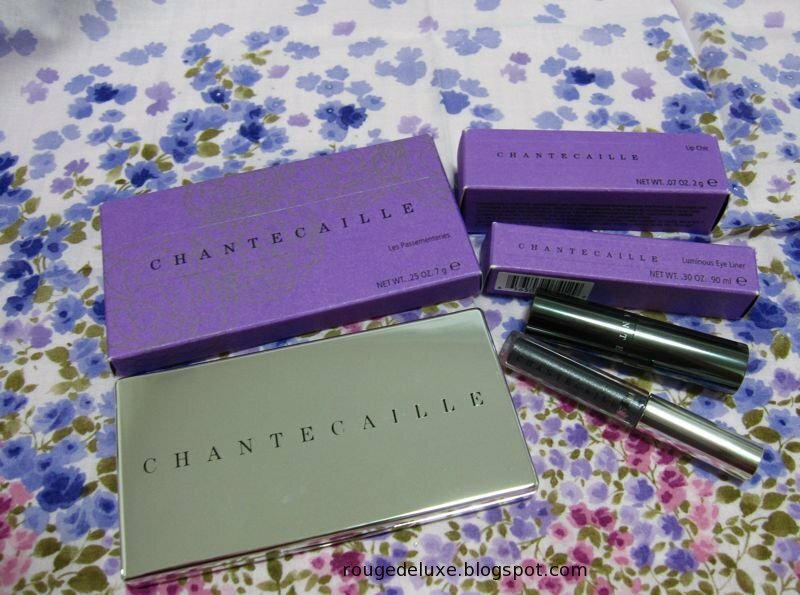 You can find the store locations on Chantecaille's website.